Ocean counties, including EarthShare NJ (ESNJ). As a statewide environmental non-profit, ESNJ is uniquely positioned to work in all of these counties to support environmental education and volunteerism. We spoke with Tom Hayes, Director of Customer and Community Relations at NJNG to learn more about their community efforts and work with ESNJ. 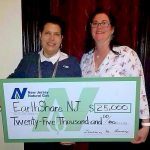 Over the past 10 years, NJNG has added ESNJ to their employee giving program, helped to start an endowment fund, sponsored numerous events, hosted strategic meetings, donated a vehicle, contributed to the continued success of the organization and Community Outreach Manager Karen Escobedo joined the Board of Directors. But their work with ESNJ is not the only environmental commitment they’ve made. In addition to supporting many of the state’s environmental organizations and ESNJ non-profit members through sponsorship and in-kind donations, they have been the sponsor of Ocean Fun Days events in Island Beach State Park and on Sandy Hook each May for 15 years. 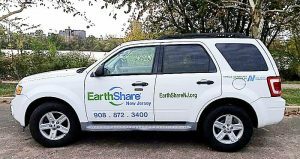 “EarthShare NJ is an exceptional organization and we encourage other companies to get involved and support its efforts,” Hayes added.